we often immediately disregard the skillset that made us so successful in school. This is mainly because life in the office-place is very different and entirely more demanding, or at least in terms of outward appearances significantly more time intensive (No disrespect to the all-nighters I used to pull). To demonstrate, take the process of time management, if you are taking five classes and you have three exams on Friday, two pop quizzes on Wednesday, and a total of four written assignments to complete. This may seem entirely second nature. Formally, your mind begins organizing, â€œStudy for this long on these dates, write paper one at this time and on this date, and so on and so on.â€ This core competency of organizing is vital to the success of individuals in the training field. As it is difficult to make the most of the training if the concern of the trainees lies elsewhere. The following steps will help your learners not only obtain more from their learning but also make them more impactful members of your organizational team. Most of us are guilty of the time management taboo of not formalizing a schedule. I tend to write my processes out on a piece of paper or occasionally log important or reoccurring tasks in a Google Calendar entry. But, I am working hard to continue and expand upon these seemingly painstaking processes. In the training world, the largest detriment to training can be the barrier of entry for in system users to encounter the offerings in the full-time window allotted in order to obtain the most from what is being distributed. It is important to note that this sentiment does not just go for the users within the organization, but also the training staff themselves. Imagine how much more effective a training program could be if more time was devoted to course creation and selection, and each component could be vetted formally in order to eliminate unnecessary questions components or just general noise. Organization skills are key to developing the ideal training and development program. In school, priorities are simple. There are concise due dates for all of your activities, â€œthis class occurs at this time on this date and these are the deliverables required to fulfill the requirements for that time period.â€ In the business world, this model is a little bit murkier. Requirements come in at the spur of the moment, clients require this particular deliverable tomorrow, and this one assignment that you have been working on (on and off) for weeks is due sometime in the next week. The transition of these mentalities is often a stumbling point for most people that are entering into the labor force and a large reason why people abandon their prior learnings and opt for the creation of a new model of organization. This doesnâ€™t have to be the case, instead, a culture of instilling a knowledge chain of the most important tasks as they arrive can be a huge benefit to employees within your system, and as such should entirely be a portion of the organizationâ€™s training efforts. 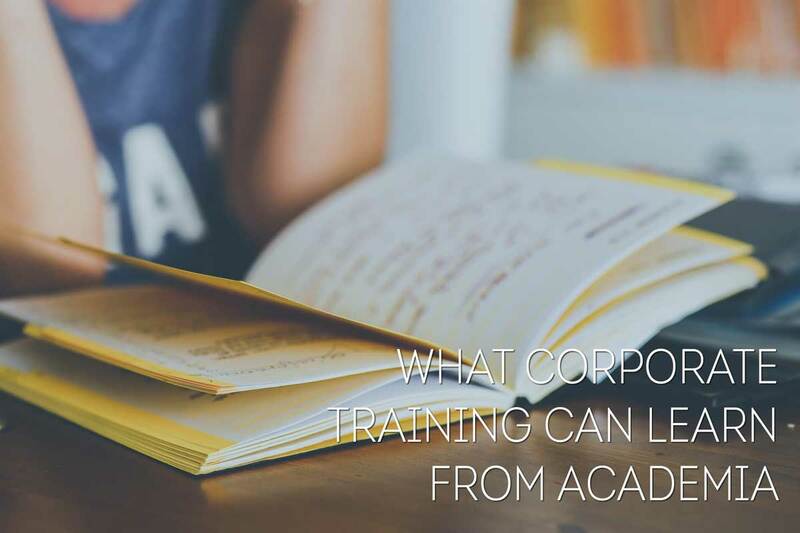 The best training programs take this lesson into consideration in the formalization of the learning and development program. If you have devoted a specific time to sit down and encounter your training, it is your highest priority task at this particular time, and you would like to get the most out of your training, it is imperative that you avoid distractions. Put the phone down, close the informative web tabs, and do not allow yourself to cheat on your training time with additional work. Our brains, while capable of accomplishing a lot of tasks at the same time, are not too great with knowledge retention in scenarios where multi-tasking is taking place. The one exception I will personally allow is reading this Gyrus Systems blog. If a formal note is required to do so, please feel free to contact us. When processes become expected practices at your desk, it is easy to become complacent. Be sure to set small rewards for yourself when you accomplish goals that you have outlined. For me, when I complete this blog, I am going to reward myself with a brief coffee break. I am quite the fan of coffee as it fuels most of these written outbursts, and will continue to throughout the weeks, however, this may not be the reward for you. Consider the regard of short breaks, or water cooler discussion, or if you didnâ€™t buy into my argument that you can be distracted by my blog and my blog only, you can also reward yourself with social media or perhaps industry publications. Be sure not to forget your teachings that have gotten you this far. What has created your opportunity for success early on in your academic career can aid in dividends for your life in the workforce. Time management, priority assignment, Distraction avoidance, and self-reward, in practice can be the difference in not only excelling in your role and future roles but also in making sure that you can access all of the wonderful training that is available to you within your organization. I hope you have enjoyed my take on the application of life skills in the workforce. Please continue to join us here at the Gyrus Blog as we continue investigating methodologies to improve the learning experiences of your personnel. As always, donâ€™t forget to subscribe to our blog in the top corner of this page (bottom if you are viewing this on a mobile application) to get the latest posts directly to your email inbox.